This powerful module allows you to automate the process of building weekly employee schedules. Our intuitive interface allows you to define labour requirements based on a variety of parameters; by task, location, time period, employee availability and skill sets. The Employee Locator feature helps to improve staff accountability and to improve the safety of remote workers by monitoring their locations when they are away from the office. This option is invaluable for delivery employees who may need assistance with directions or some other event. Automated Scheduling - Automatically shifts to employees based on job skill and availability. Use templates to generate multiple schedules easily. Dynamic Constraints - Use customized availability profiles to match each employee's skill set and position. You can even manage full and partial day-off requests including maximum hours per day and week and minimum hours between shifts. 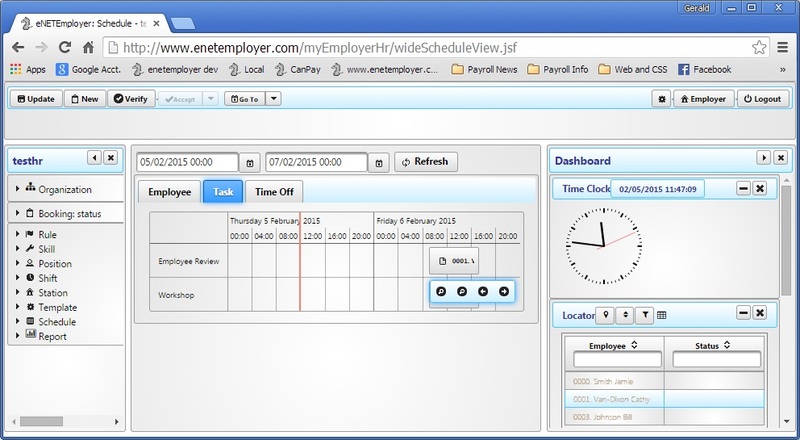 Employee Interaction - Allow employee to perform shift swaps online as well as submit time-off requests, check shift and staff availability and view company work schedules. Multiple Sites - Easily manage multiple work locations so that you can define employees and their skill levels across all sites. Use the flexible reporting system to review data by location and employee type. Multiple Shift Rotations - Create multiple different shift rotations to handle any level of complexity. Assign shift rotations to employees, or allow employees to specify their own availability. Bi-Lingual Support - The program supports both English and French languages for full employee support. Printing and Reporting - Produce your shift schedules then preview them on the screen for accuracy. Once complete, you can make them available for all employees for their use. Call 1-800-665-5129 now and get started with eNETEmployer Scheduling today!